Home Tags Posts tagged with "langos"
Every year around Easter, I invariably muse that it would be nice to post an Eastern European lamb recipe on these pages, and then realize that lamb isn’t really eaten with any regularity in that part of the world. Lucky for me, there are a few exceptions in regions with a Muslim population, in the Balkans, and in a some pockets populated by the sedentary descendants of forgotten nomadic Turkic peoples. One example of the latter is Cumania. Cumania (Kunság in Hungarian) is divided into Little Cumania and Greater Cumania, both located within a Budapest-Szeged-Debrecen triangle in the Great Hungarian Plain. This is the land of the Cumans, former horse-riding warriors who, after Mongol attacks in the 13th century, were offered refuge in Hungary by King Béla IV. Over a mere few years, the Cumans converted to Christianity, fought the Mongols, were betrayed by the Magyars, went on a rampage of destruction through Hungary, left for the Balkans, and were invited back by the same but now defeated King Béla IV to repopulate a region that had become almost uninhabited after the Mongol raids. But what matters to us today is that the Cumans’ main activity used to be animal husbandry, with a predilection for horses, cattle, goats, and sheep. And according to George Lang, Little Cumania (Kiskunság) remains the the only Hungarian region where lamb is consumed with some regularity year round. Not that there are many Cuman recipes around, mind you. The ones I’ve found aren’t all that different from other Hungarian dishes, either. In fact, the only recipe in George Lang’s Cuisine of Hungary called Cumanian something is a Cumanian mutton paprikás with cabbage. Besides that, still in Lang’s book, there’s a shepherd’s millet (similar to kasha, with diced lamb, onions, lard and paprika). I also found, in A Magyarok Asztalánál (a cookbook in Hungarian), Cumanian peppers stuffed with rice and veal (no lamb), in a cabbage-paprika sauce. Other than a taste for cabbage and paprika, it seems hard to grasp a distinctive Cumanian cuisine, and it’s safe to say that today’s Cumans eat pretty much the same as the Magyar who surround them. No wonder then that today’s recipe took a lot of soul searching and has been over five years in the making (it also didn’t help that I worked on it only once a year). To summarize, I wanted something with lamb, cabbage, and paprika, inspired by other familiar Hungarian dishes, but a little bit more festive than paprikás or kasha. A Sunday showpiece other than a leg of lamb, that would instantly evoke the distinctiveness of the occasion. And so I give you… Cumanian Lamb Wellington. Obviously, it’s not made with beef, but lamb. And I don’t use the tenderloin but the lamb noisette — the equivalent of ribeye. No mushroom duxelles or prosciutto here, but ground lamb with paprika and cabbage leaves instead (the Cuman touch). Finally, instead of baked puff pastry, I use lángos dough and deep-fry the whole thing. Not just for the sake of being more Hungarian, but also because it’s really a technical change for the better. 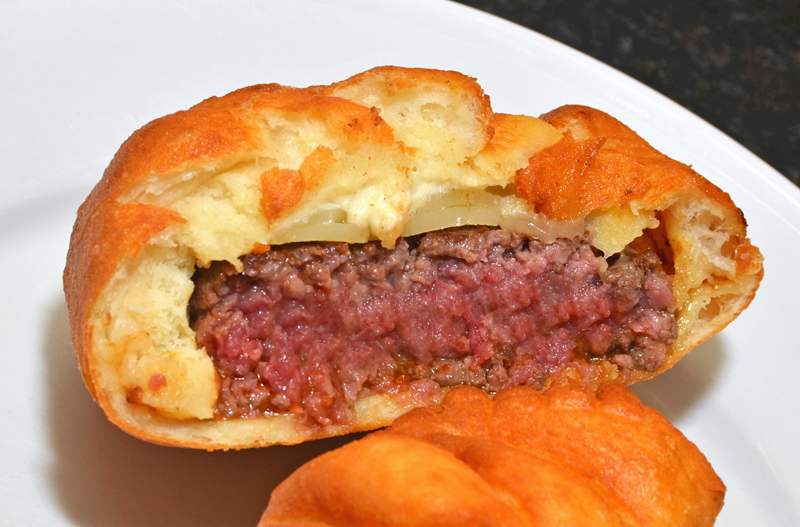 When was the last time you had fluffy, crunchy puff pastry in a beef Wellington? Never, that’s when. The weight of the beef itself, the meat juices, and the steam make this impossible. The lángos dough, on the other hand, comes out exactly how lángos should be, even with a large chunk of meat in the middle (just remember my lángos burger). I complete the dish with a couple of sides that add even more Cuman-ness and Hungarian-ness: a lecsó (vegetable stew with paprika) inspired by George Lang’s recipe, and cabbage galuska, the Hungarian equivalent of spätzle. Bone the rack of lamb, and trim all the fat and silverskin from around the center lean meat (reserve the trimmings). 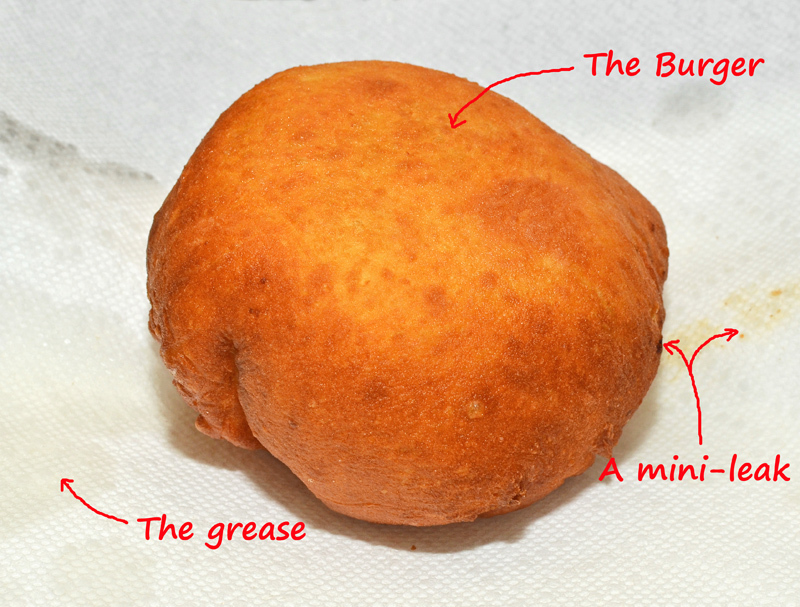 You might notice a strip of lean meat separated from the center by a line of fat. You can leave it all attached; or cut it off, remove the fat, and seal the meat back by sprinkling transglutaminase (and refrigerate at least 1 hour). Cut the boned meat in half crosswise; you should have two cylinders, each 10-11 cm long, 5 cm diameter, weighing about 160-170 g (though this may change depending on your rack). Scrape the meat from the rib bones (especially between them) and add to the reserved trimmings. Add enough lamb shoulder meat to reach 250 g, with approximately 20% fat if possible. Cut into large dice, then pass through the small die of a meat grinder, into a bowl. In a food processor (or a blender), blend the ground meat, salt, paprika, egg yolks, and crème fraîche on medium speed until almost smooth. Do not over-blend or the mixture will become rubbery. Fold in the grated lemon zest, grated garlic, and chopped parsley. Reserve in the refrigerator. Blanch the cabbage leaves in salted boiling water until soft, then shock in ice water and let cool. Take the leaves out of the water, pat dry with paper towels, and remove the thick central ribs. Overlap two cabbage leaves and trim the edges to obtain a 15 cm x 18 cm rectangle. With the short side of the rectangle facing you, spread half of the forcemeat into an 11 cm x 16 cm rectangle in the center of the cabbage leaves, and top with a lamb cylinder (see picture below). Roll the cabbage leaves over the meat and fold the edges, then wrap very tightly in several layers of plastic film. Repeat with the rest of the cabbage and meat, and refrigerate for at least 6 hours. Blanch, peel, seed, and cut the tomatoes into small dice to make tomato concassé. Measure 315 g, and reserve. Heat the olive oil in a pot over medium heat. Sauté the onions and peppers in the oil for about 10 minutes, stirring regularly, until they start to brown. Add the tomato concassé, sugar, and salt, and cook for another 10 minutes, until the tomatoes are almost dissolved. Add the paprika, stir for 1 minute, then remove from the heat, and reserve. Cook the potato in simmering water until very tender. Drain, mash, then measure 75 g, and let cool. Mix half of the milk with the yeast and sugar, and let rest for 5 minutes. Combine the flour and salt. In the bowl of an electric mixer fit with the paddle attachment, mix the mashed potatoes and remaining milk on medium speed. Add half of the flour, then the melted butter, then the remaining flour, then the yeast mixture. Continue mixing for about 30 minutes. Cover with plastic wrap, and let rise for 1 to 2 hours, until doubled in volume. Blanch the cabbage leaves in boiling water until soft, then pat dry with paper towels, and measure 80 g.
Place the cabbage and 2/3 of the butter in a blender, and process until smooth. Let cool for a minute, then add the eggs and egg yolks, and blend again. Transfer the cabbage mixture to a stand mixer fit with the paddle attachment. Add the flour and salt, and mix on medium speed for 3 minutes. Let rest for 30 minutes. Bring a pot of salted water to a boil. Proceeding in small batches, scrape the dough through a spaetzle maker into the boiling water. Cook until tender (about 1 minute), then use a skimmer to drain onto a sheet pan lined with parchment paper. Toss with some of the remaining butter, and spread evenly on the sheet pan. When done, cover with plastic wrap, and reserve. Cook the lamb rolls in a 58 C / 136 F water bath for 3 hours (if they’ve been wrapped in at least 3 layers of plastic film, they don’t need to be placed into a sous-vide pouch). Heat the canola oil to 175 C / 350 F in a deep-frier. Unwrap the lamb rolls, and dry on paper towels. Let cool for a few minutes. 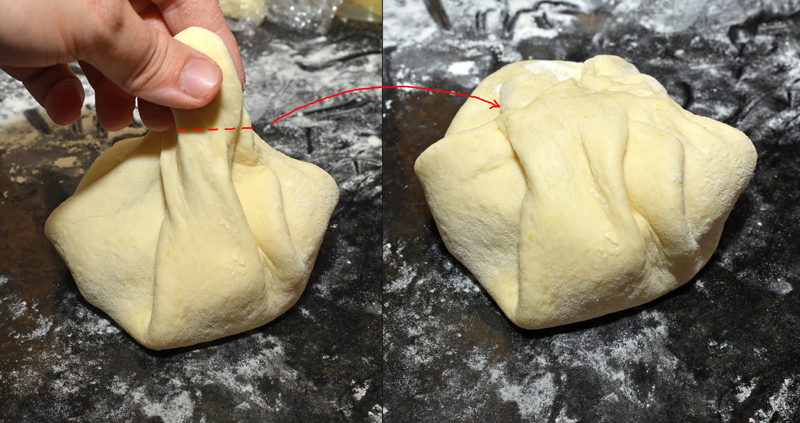 On a work surface dusted with flour, roll the lángos dough into 2 squares of 20 cm each. 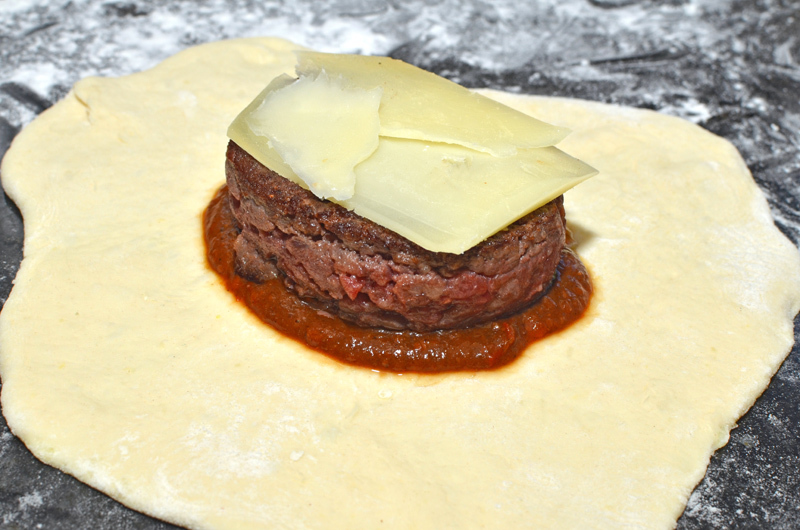 Place a lamb roll on each square, then roll the dough over the meat, fold the edges, and tear off any extra dough; you want the meat to be sealed in the dough, without having double layers of dough at the ends. Without waiting, delicately lower the lamb Wellingtons into the oil, and deep-fry until quite dark brown. Take out of the oil, and drain on paper towels. Reheat the lecsó over medium heat in a saucepan. In a pan over medium-high heat, heat the butter and canola oil. Sauté the shallots and cabbage galuska until lightly brown. Remove from the heat, and sprinkle with chives. Cut each lamb Wellington into three portions. Cover the bottom of each plate or bowl with half galuska, half lecsó. Top with a slice of lamb Wellington. Serve while spinning a yarn about the traditions of Little Cumania.